Despite a sizable investment in marketing-automation software, many marketers approach marketing with an ad hoc approach — a series of blast emails designed to fill a newly identified gap or need. While this approach does at least keep your company name in front of your audience, there is copious overhead in the creative and deployment processes that create an unnecessary drain on your resources. With any marketing campaign, your primary goal is to increase engagement, raise lead scores, and determine sales readiness in order to pass the lead to sales at the most-appropriate moment. Achieving this with a series of unrelated, one-off blast emails is exponentially more difficult than the development of a consistently designed and carefully deployed automated program. In this article, we will discuss various implementations of the three email types — one-off blast emails, top-of-mind drip marketing, and purchase-enticing nurture marketing — and how you can use this combined approached in order to meet the primary goal. 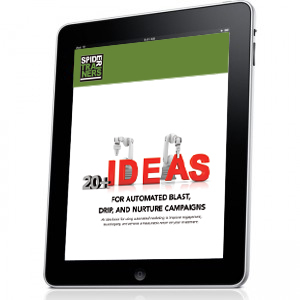 To continue reading this article, click here to subscribe and receive 20+ Ideas for Automated Blast, Drip, and Nurture Campaigns; An idea book for using automated marketing to improve engagement, build loyalty, and achieve a measurable return on your investment. Are looking for ideas for your drip campaigns. Are looking for ideas for your nurture campaigns. Would like to know more about marketing automation. Would like to improve engagement and conversions. If any of these describe you, Spider Trainers can help. We are marketing-automation architects and we will analyze your need and create a campaign for you that will ensure your return on your email-automation software investment — even when you’re feeling the pinch of full workloads and too-few resources. Spider Trainers is a network of more than 80 experts in email development, web development, search-engine optimization, analytics, graphic design, ad creation, multimedia creation, social-media postings, writing, and editing. We bring all of these disparate talents to bear on your project, to ensure that every functional requirement is met with the expertise it requires. Our publications are designed to help you identify need, understand the topic, and enable you to engage in development discussions. While we may be guilty of giving too much information, we know that the empowered and informed client is the successful client. We hope this guide does that for you. We look forward to learning more about your needs. Please contact us at 928-358-1839 or spidertrainer@spidertrainers.com.